Pianist Tom Grant cut his teeth playing first-class jazz and pop, genres he still performs and records to this date. Sipping Beauty is, however, his second foray into slightly different musical territory. He still exhibits his terrific knack for crafting warm, engaging melodies, but on this recording (as on its "predecessor," The Light Inside My Dream, he softens the jazz elements, and throws in influences from chill-out, new age, and ambient. However, once a jazz hound always a jazz hound, so to me, this still has the soul of jazz, albeit with a more structured basis and an emphasis less on improvisation and more on laying down solid grooves and great refrains. However you break it down, it makes for a highly entertaining listen. 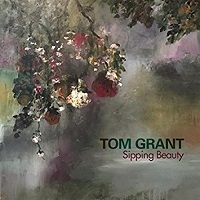 Sipping Beauty (a title which I must admit I find a bit cryptic) doesn't really sit in the same vein as albums from folks like Dave Mauk, David Wahler, or Davol, even though they also are piano players who accent their leads with assorted electronics and keyboards. Truth to be told, the best comparison I could make is to a "one hit wonder" by Peter Blake titled Private Dawn in 1994 on the gone-but-not-forgotten Jon Mark's White Cloud Music label. It is in my personal top 50 of all time, and Sipping Beauty compares quite favorably to it. Both recordings accentuate mellow rhythms married to jazz-influenced melodies with first rate electronic elements in the picture as well. It's easy to surmise that Sipping Beauty's theme is romance. What with song titles such as "Wrapped In Love," "Sighs and Whispers," and "Desire Unspoken," (among others), as well as the more sensual side of some tracks (the opening "Petrichor Perfume" marries a bossa nova rhythm to softly swinging piano and Kevin Karrick's Spanish-flavored guitar), Sipping Beauty would likely prove a great album to play during romantic interludes (picture a 30-story apartment overlooking Central Park West…it's sunset and a couple who've just finished their martinis are dancing cheek-to-cheek as the setting sun streams through the window, coloring the room with a lush orange glow – I know, I am a hopeless romantic). I have to tip my hat to how adroitly Grant wields his assorted keyboards and rhythms. The flowing textures which are the undercurrent of the title track are gorgeous and expertly layered. His use of bell tones (the type which are almost always linked to new age music) on the next track, "Feathers Falling Up," are counterpointed by soft hand drum percussion and David Captein's subtly jazzy bass playing. "Wrapped In Love" is one of the more overtly jazzy songs, but it's subdued in nature and unwinds at a pleasantly languid pace. "Desire Unspoken" once again features Karrick's great acoustic guitar playing, but here the Spanish flavor is replaced by smooth jazz elements and Grant's piano playing is a highlight. "Moondrops" is the track that stands out the most as a departure from the album's "formula," as it features overt synthesizer tones looped over the piano melody, as well as some sitar from Captein, and a slow tempo beat. Despite how distinctly different it is, it still fits in just fine with the album as a whole. Summing up, Sipping Beauty is filled with great music which perfectly merges the new age, smooth jazz, and chill-out genres. Grant’s fluid romantic melodies on piano are fleshed out with excellent keyboard accents, soft rhythms, and solid support from his guest stars. I have played this album 10 times and it’s an enjoyable listen each time. All I would add is "More please, sir."